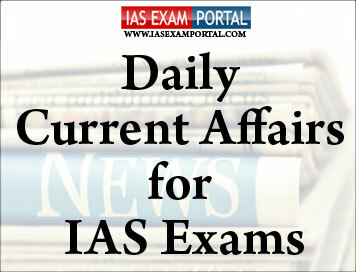 Current Affairs for IAS Exams - 13 APRIL 2019 | IAS EXAM PORTAL - India's Largest Community for UPSC Exam Aspirants. Vice President M Venkaiah Naidu will pay homage to martyrs of JallianwalaBagh massacre on the centenary of the gruesome incident at the JallianwalaBagh Memorial, in Amritsar, Punjab today. Mr Naidu will release a Commemorative Coin and Commemorative Postage Stamp. The event is marked to observe the centenary of the massacre in which hundreds of innocent men, women and children were killed by Brigadier General Reginald Dyer, during a peaceful meeting at the park on this day in 1919.It was declared a national memorial by an Act of Parliament in 1951. President Ram NathKovind today paid tribute to the martyrs of JallianwalaBagh tragedy. In a tweet, Mr Kovind said, 100 years ago on this day, the country's beloved freedom fighters were martyred at JallianwalaBagh. He said, a horrific massacre, a stain on civilisation, can never be forgotten by India. In a tweet, Mr Modi said, when the country is observing 100 years of the horrific massacre today, India pays tributes to all those martyred on that day. He said, their valour and sacrifices will never be forgotten. Mr Modi said, their memory inspires us to work even harder to build an India they would be proud of. Alerted by the Union Health Ministry’s pharmaceutical watchdog, the National Co-ordination Centre of the Pharmacovigilance Programme of India (PvPI), on adverse reactions that were being reported from some commonly-used antibiotics, the Central Drugs Standard Control Organisation (CDSCO) has now asked manufacturers to ensure that this information be made available to the general public. CDSCO has written to drug manufacturers, to mention in leaflets inserted into drug packets or on promotional literature, information about the adverse reactions of these medicines. All of the seven formulations — antibiotics Cefotaxime, Ofloxacin and Cefixime; Tranexamic Acid, used to control bleeding; antipsychotic drug Quetiapine; anti-rheumatoid drug Sulfasalazine and the anti-epileptic medicine Sodium Valproate have been instructed to warn patients of the “new” side effects. The letter was sent out by CDSCO on April 9. Banks need to upgrade their Point of Sale (PoS) devices to run on 3G and 4G in the backdrop of the impending phase-out of 2G technology to which they are mated now, a senior telecom department official said. “The PoS the banking sector uses is right now 2G-enabled. In a couple of years, there will be no 2G in the country. [There will only be] 3G and 4G and beyond. Are we getting the PoS ready for the 2G moving out?,” Joint Secretary AmitYadav said. Unless such upgrade happens, banks would face challenges. “I think we need to see to it that [more advanced] technology is there,” the official said, inaugurating the 5G Use Cases Lab for the Banking and Financial Sector, set up at the Institute for Development and Research in Banking Technology (IDRBT). Stating that 5G had arrived, Mr.Yadav said it was time for all those concerned to discuss the areas where the technology could be applied once it is rolled out in the country by developing use cases. The infrastructure in the country had also improved, Mr.Yadav said, adding that in three years, the number of mobile towers had increased from less than two lakh to five lakh, while the Base Tower Stations (BTS) numbers had gone up from 5-6 lakh to over 20 lakh. The number of mobile phone users is 1.2 billion, he said. The objectives of 5G Lab include developing and demonstrating 5G use cases for banking and financial services, setting up a 5G R&D experience platform, and provide state-of-the-art experimental test bed solutions for mobile, wireless technologies, IoT and security services for BFSI. Industrial growth slowed in February to 0.1%, driven by an across-the-board slowdown, especially in key sectors like manufacturing, mining, capital goods, and infrastructure, according to latest official data. Separate data showed that retail inflation quickened in March to 2.86% from 2.57% in February, driven in large part by the food and fuel sectors. Growth in the Index of Industrial Production (IIP) slowed in February from 1.44% in January. Within the Index, the mining and quarrying sector saw growth slowing to 2% from 3.92% over the same period.The manufacturing sector saw a contraction of 0.31% in February from 1.05% in January. “The IIP data broadly indicates the slowing down of the economy, which was reflected in the quarterly GDP data,” said D.K. Srivastava, chief policy advisor, EY India.“The outlook should be thought of in terms of stimulating investment demand in the economy through monetary and fiscal measures,” he said. The capital goods sector continued its contraction in February, contracting 8.84% compared with a contraction of 3.42% in the previous month. The UN Security Council has voted unanimously to completely end its peacekeeping operations in Haiti on October 15 and establish a political mission to support government efforts to promote order and development in Latin America's poorest country. The resolution approved gives a final six-month period for such operations and asks Secretary-General Antonio Guterres to plan a political mission. Haiti's leaders had asked the UN to allow government authorities to fully assume responsibility for security. Acting US Ambassador Jonathan Cohen welcomed the resolution, saying it "will mean a significant handover of responsibility back into the hands of the Haitian government and its people. In Sudan, the new military rulers have agreed for talks with all political groups on forming a civilian government. Protests were held across the country against the military rule after the removal of former President Omar al-Bashir in a palace coup. Demonstrators demanded a civilian body to lead the transition to democracy. The US has called on the military council to exercise restraint and to allow space for civilian participation within the government. The EU urged the Sudan army to carry out swift handover to civilian rule. Bashir, who swept to power in a 1989 coup, was one of Africa's longest-serving presidents. He is wanted by the International Criminal Court on charges of genocide and war crimes. Admiral Sunil Lanba, Chief of the Naval Staff, inaugurated the maiden ‘state-of-the-art’ Virtual Reality Centre (VRC) at the Directorate of Naval Design (Surface Ship Group), today. This centre would provide major boost to the Indigenous warship design capabilities of Indian Navy, providing impetus to self-reliance and greater fillip to warship construction under “Make in India” initiative of the Indian government. During his address at inauguration ceremony, Admiral Lanba complimented the Directorate for their untiring efforts, foresight and initiatives to conceptualise design and execute the project. This project will facilitate collaborative design reviews for continuous interaction between the designers and the end users to improve design and ergonomics onboard warships. Directorate of Naval Design (Surface Ship Group) had a humble beginning in 1960s and since then has made major contributions towards indigenous warship design capabilities of the Indian Navy improving self-reliance for warship design and construction. The multi-disciplinary team has successfully developed 19 warship designs on which more than 90 platforms have been constructed todate. Ajay Malik and DiveshGahlot helped India beat eighth seed China 2-0 in the match for the 9-12 places in the Asia Oceania Junior Davis Cup under-16 tennis tournament here on Friday. Ajay fought his way past Jiang Yun-An in the first singles, clinching the rubber 11-9 in the super tie-break. Divesh secured the victory with a 6-4, 6-2 triumph in the second match. In the semifinals, third seed Australia beat top seed China 2-0. Second seed Hong Kong stopped the fine run of Syria with a 2-0 victory.